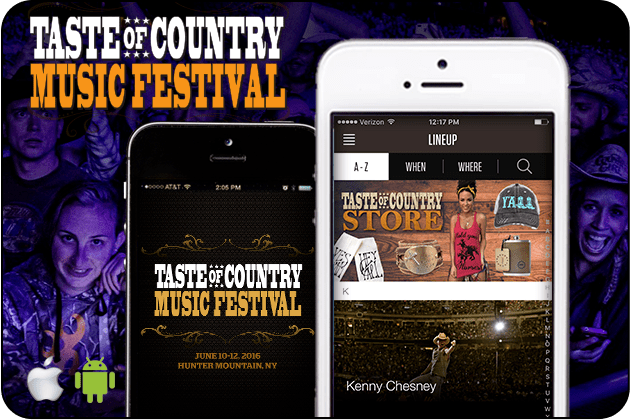 Taste of Country Festival is very excited to release the official iPhone and Android Festival Apps! This new and improved app features an up-to-the-minute lineup & schedule, beautiful artist photography, the latest festival news, my schedule for planning your trip up on the mountain and more. Track My Tent: The campgrounds are HUGE, so we make it easy to get home after the festival each night. Scavenger Hunt: From uploading pictures to social media, to checking in at different points of the festival, participate in an interactive scavenger hunt and win big prizes! My Schedule: Create your own schedule of who you want to see during the festival. Up-to-the-minute schedule and festival lineup with quick filters for finding your favorite artists. Artist pages for every performer including videos, bio, photos and more. Latest festival news, videos and updates. Notifications for important festival and artist updates. Buy tickets right from the app.